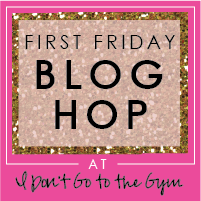 Welcome to I Don't Go to the Gym's First Friday Blog Hop! This hop happens the first Friday of every month so we hope you continue to join us! 1. Follow us via GFC or Bloglovin' here! 2. Follow & visit our lovely co-hosts! 3. Link up your home page, bloglovin' page, favorite post - whatever YOU wish to promote! 4. Share about the hop by grabbing our button or share with twitter, Facebook or pinterest. The more successful the hop is, the more potential followers for YOU! Want to co-host? Visit our advertise page as co-hosting is available with ALL of our sponsorship programs. Thanks for hosting, ladies! Have a great weekend! Pretty nice blog. have a good event. Hope you have a great weekend, thanks for hosting. Thanks for hosting this great linky! Just linked up, thank you so much for hosting! :) Have a fabulous rest of your weekend!